The police in Niger State have arrested two suspected motorcycle thieves terrorizing Kpakungu in the Chanchaga Local Government Area of the state. 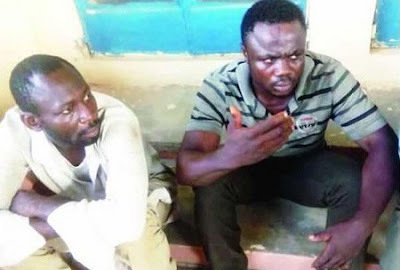 The suspects-Danjuma Idris, 28, and Mohammed kudu, 27,were apprehended by the police operatives after robbing one Johnson Emeka of Ketaren Gwari, of his Jingcheng motorcycle. Northern City News gathered on Tuesday that the bandits were sent by one Abdulsalami Abdulkareem, 27, of Farm Centre Tunga, Minna to deliver the motorcycle to one Sadam Dutse in Kaduna State. Checks revealed that the suspects had been involved in robbery for many years before they were apprehended. He said, “Things are hard, l am looking for what to survive on since there are no jobs anywhere. I have been in this business of snatching motorcycles from people for years. “The bricklayer job I was doing cannot sustain me, people are no longer building houses as before and things are hard for young men and that was why I resorted to snatching motorcycles from people,” he said. The Command’s Public Relations Officer, Muhammad Abubakar, said detectives had also arrested one Abdulsalami Abdulkareem, who allegedly connived with the suspects to steal the motorcycle. He said the suspects would be charged to court after investigation.